The ancient city of Hue has not only wonderful historical sites and amazing cuisine, but also stunning natural sceneries, especially a lot of beaches. Here are top 5 best beaches in Hue. Located about 20km from Hue city and more than 7km from Da Nang city, Lang Co has been reputed for its pristine beauty with a crystal-clear, turquoise lagoon on one side and 10km of beachfront on the other. In summer, the weather in here is very cool and comfortable. You can enjoy normal beach activities such as swimming, fishing,… as well as try marvelous foods (both traditional foods of Hue and seafood are available). Besides, you can visit Bach Ma National Parks located about 30km away Lang Co or explore Hai Van Pass. Thuan An beach is situated nearby Thuan An Mouth, where Huong river run to Tam Giang Lagoon and then to the sea. The beach stretch 12km with white sand, clean water and peaceful surrounding. Coming to Thuan An, you can set up a camp and stay overnight on the beach or make a BBQ party with fresh seafood. If you start at Hue city, you should hire a motorbike and ride to the beach, because you can have chance to see the countryside and nice villages on the roadsides as well as beautiful Tam Giang lagoon. Canh Duong Beach, located about 20km away from Hue city, is considered as the beach with most beautiful scenery in Thua Thien –Hue province. 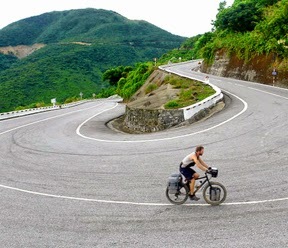 With the length of 8km, the width of 200m, bended with arc shape, situated between two mountains: Western Chan May and Eastern Chan May, creating a very beautiful landscape. The beach is featured with pure white sand, turquoise water and a long line of casuarinas trees. Visiting Canh Duong beach, you can enjoy the deserted beauty of nature, feel the cool and fresh air and get yourself out of daily stress. Vinh Thanh beach is located about 30km from the southeast of Hue city. It is not as famous as Thuan An or Lang Co, but convenient public transport, clean beach and low-price seafood are the reasons that Vinh Thanh attract many tourists. The beach is highlighted with bright sunshine, cerulean sky, gentle waves, stretched white sand, pure water and lovely sunset as well as quite neighbor. Located in Vinh Hien commune, Phu Loc district, on the other side of Tam Giang lagoon, Ham Rong beach lies on a very good position, with poetic landscape of Thai Linh Mountain lying behind a 6km curling green forest embracing the beach. There are 3 beaches here, including Ham Rong, Dong Duong and Bai Dam. They are featured with clean turquoise water and small rocks standing spreadly from the shore to the sea.